This, the first edition of Henry Schenck Tanner's 1829 wall map of the United States, is one of the most important American maps of the 19th century. The map covers from the Missouri river in the vicinity of Fort Mandan eastward to the Atlantic seaboard and from the Great Lakes to the delta of the Mississippi. South Florida is included via an inset appearing on the lower right quadrant. The Pacific Northwest, including Oregon, as well as modern day Idaho, Washington, Montana, and Wyoming, are continued in an inset at the top center, just above Lake Huron. Tanner identifies various American Indian nations as 'districts,' particularly in the Trans-Mississippi region. These include the Huron, Sioux District, Mandan District, Osage District and Ozark District, among others. He also includes all major roadways as well as distance measurements between towns - a useful detail which the accompanying memoir notes caused the map to take twice as long to prepare. The whole is surrounded by 14 inset maps detailed various American cities. These include the Environs of Albany, Environs of Boston, Environs of New York, Environs of Philadelphia and Trenton, Environs of Baltimore and Washington, Cincinnati, Charleston, New Orleans, Washington, Baltimore, Philadelphia, New York, Boston, Pittsburg and Environs, as well and regional maps detailing south Florida, Oregon and Mandan. 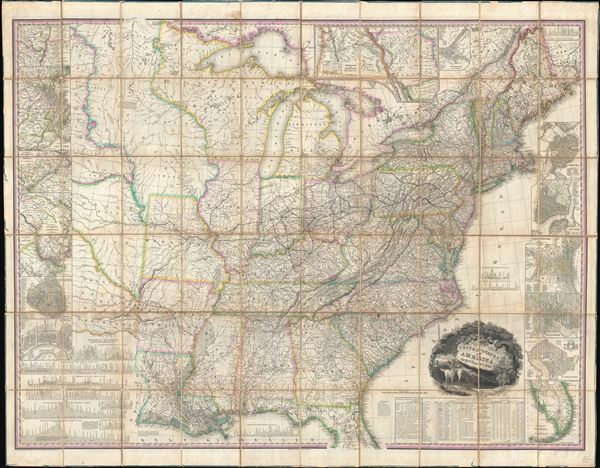 With this important map Tanner initiated a new age of quintessentially American cartography. Unlike his predecessors, Melish and Carey, Tanner was born and raised in the United States. His maps are stylistically unique, providing a wealth of information with fine highly detailed engraving. We offer this map accompanied by both the first and second editions of Tanner's fascinating Memoir on the Recent Surveys, Observations, and Internal Improvements in the United States in which he expounds upon the process of producing this remarkable map. Tanner engraved this map with assistance by E.B. Dawson, and W. Allen. The title cartouche, which pictures a country landscape with two deer in the foreground, was engraved by J.W. Steel. Tanner's map proved both useful and popular, with several editions to follow. Rumsey notes edition sin 1829 (present example), 1830, 1832, 1834, 1836, 1838, 1839, 1841, 1843, and 1850. Although he does not offer references to this, it is likely that Tanner derived some of the basic cartography from J. and A. Walker's map of the United States which was published in London two year prior. Regardless, this was the premier map of the United States until superseded by Mitchell's map of 1834. Very good. Dissected and mounted on linen by publisher. Accompanied by original red lether binder and two volumes of related text.